Have you ever dreamed about running the Vermont 100, the ultra race where horses and humans share the trail, but figure you could never stay awake all night? Are your weekends consumed with carpooling your kids to sporting events and birthday parties? Are you just getting started and reluctant to head off into the wilds on a course you are not sure you can even complete? 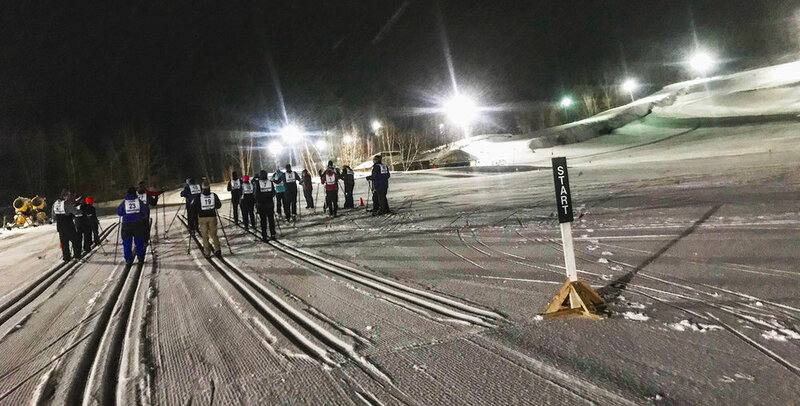 Then the Tuesday evening – Jan. 15 to Feb. 19 – XC Ski/Snowshoe Citizens Races at Gore’s North Creek Ski Bowl is just what you have been waiting for! And, yes, you heard me correctly. Classic and skate skiers and snowshoe runners and walkers compete on the same lit, professionally groomed stadium course, complete with a singletrack line, ample corduroy gliding areas, with the inside lane reserved for the snowshoers. Participants can trace the circuit up to four times, yielding a maximum distance of three miles. Obviously, skiers finish the route way before the snowshoers and they are welcome to get in a few bonus miles, while the rest of us complete the journey. Registration begins at 5:30pm with a 6pm start. Admission is only $10 per night, with no charge for season pass holders. Saratoga Stryder Matt Miczek made it for the first event and I joined him for the second. There were 14 participants, with the majority being skiers. Needless to say, I felt rather intimidated and a bit concerned that I would be run over. The mass start was exciting but it only took about 10 seconds for the skiers to outdistance us. I did have one moment of glory when I passed some classic skiers going uphill, but obviously I didn’t stand a chance. Like many XC ski races, the route was a mix of uphill or down, with flats in between. I counted three longer hills, but none were overly intimidating. It was exhilarating to play hooky and escape normal weekday night chores. The route was romantically lit (good date night material), we had just been blessed with two feet of fresh powder, and the moon was two days past full. One of those picture-postcard evenings! But what stood out to me was the casual atmosphere and enthusiasm of the Gore Mountain staff! They seemed to know everyone by first names and were genuinely glad to greet newcomers. The event reminded me of some of our earliest snowshoe races, when everyone was simply glad to be there and enjoying the outdoors – even down to the part where we patiently waited while the start was delayed to accommodate a latecomer… Try and find that consideration in a mega-race! Afterwards, the food truck offered dinner and beverages and we gathered around hoping we would win a raffle prize. There were farm fresh eggs from Cobble Hill Farm, wool scarves knitted by an employee, hats and gear from the Gore ski shop, Adirondack Life calendars, and $20 gift certificates from Beck’s Tavern, Basil & Wick’s, barVino, and Barkeater Chocolates. Each time you participate you are given a slip of paper for the raffle, and after the drawing all slips are retained for the final big bash on February 19 – which will also be a fun full moon party. What a deal! My only regret is that I didn’t participate in the first race on January 15. See you there! Laura Clark (snowshoegal133@gmail.com) of Saratoga Springs is an avid trail runner, ultramarathoner, snowshoer and cross country skier. She is a children’s librarian at the Saratoga Springs Public Library. Mount Van Hoevenberg Ski Center is also hosting a once a month “fun race” series with 3K, 6K and 12K courses in a supportive environment, aimed for those new to racing or experienced skiers. The first two races were in December and January, and the third will take place on Saturday, February 23 at 11am. The series will culminate with the Lake Placid Nordic Festival on Saturday, March 16.